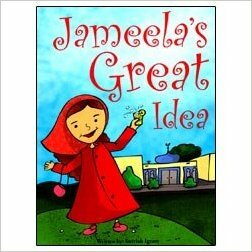 Jameela’s Great Idea by Surriah Igram is a good read-a-loud story for small groups. A simple story of a girl seeing her father give sadaqa, charity, on a nightly trip to the masjid, wants to also give charity. But, to do so, she must first find a way to acquire some money. Her ideas are lavish, over the top and silly, but her ever patient mom let’s her pick one idea to bring to fruition, which luckily, alhumdulillah, is the only reasonable one presented. I feel like discussion is needed with this story to provide commentary on why the ideas are not practical even though her intention is so noble. The story is very simple, linear, and age appropriate. It works well for preschool and kindergarten age groups with big colorful pictures, large font, and its oversized presentation. The message is beautiful as are the pictures. Little Jameela has a supportive involved family, they enjoy going to the mosque, they behave in the mosque, yet have fun outside in the yard, and images of covered and uncovered characters are present. Arabic and English signage decorate the landscape and the book isn’t too long at 30 pages. After reading it, I think children will enjoy going back to look at the pictures, however, I don’t see it being a high demand repeat read request. Once through is pretty sufficient in getting the message, chuckling, having a little talk about it, and then moving on. The book is a great introduction to the importance of charity in Islam, but would need to be supplemented to fully convey to even the little ones, the value of giving to others.